How long does preparation take YOU? 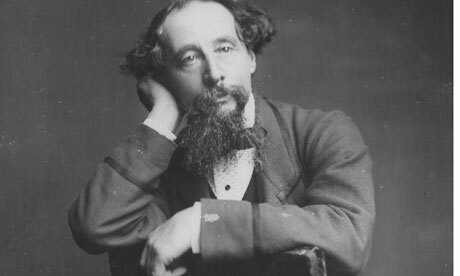 Forgive me for repeating myself (a frequent and unattractive trait), but there’s this Dickens thing coming up. Tomorrow. (By the time you read this it will probably have happened already). Oh sorry! If you don’t know what I am talking about, it’s a show I am doing/have done with friend and colleague Steve Bingham about the magical storytelling of Charles Dickens. The British Council asked us to do it and we have had great fun putting the words and music together for the show. Oh, and since it’s his 200th (and 1 day) birthday today here’s a last photo of of him! But the point is – and the point of this post – is that it took a long long long long time to choose and prepare and rehearse and tryout our 65-minute show. Hours of time. And it’s the same with conference presentations. I was talking to my colleagues at a conference in Barcelona last weekend, and there seems to be some variability about this. Some presenters (like me) spend hours and days and weeks building huge documents of notes, suggestions, pictures etc until they gradually coalesce into something that has a narrative – and the possibility of engaging a group of listening teachers. Others seem to be happy to throw a new idea – or a quick description of what they are doing – at an audience in record time. And what happens when/if the talk is ready? Well for me it takes about two or three ‘goes’ before I feel really comfortable with what I am talking about – before I know how to pace things well. At the weekend I saw a brand new talk from Scott Thornbury on the use of gesture, physical movement etc in language learning and teaching. I would happily listen to it/watch it again tomorrow because like all his talks it was engaging, thought-provoking and enjoyable. I’d love to see it again after 3 or 4 more outings too – to see how it has evolved! Is that the same with planning lessons, I wonder? Right now I SHOULD be preparing 3 new talks for a trip to Vietnam in two weeks. But I am blocked by the knowledge that there is no time.Help me someone!!! It’s all Mr Dickens’ fault. What about you, I wonder? How much preparation do you need to do when you present to teachers (or work with students)? How do you plan a successful presentation? I was chatting on the phone to one of my friends the other day. She is the deputy head at a large primary school here in the UK. She was telling me that she had to give a presentation to 300 or so primary teachers and heads in which her task was to explain her school’s approach to the curriculum. And so we got to talking, as you do, about how to plan a presentation, and how to make information transfer (which is what a lot of presenting really entails) engaging and thought-provoking. Inspiring even – and the work she does should inspire people, it really should! And just for good measure we talked about the pitfalls of using powerpoint (a topic I have gone on about before on this blog). 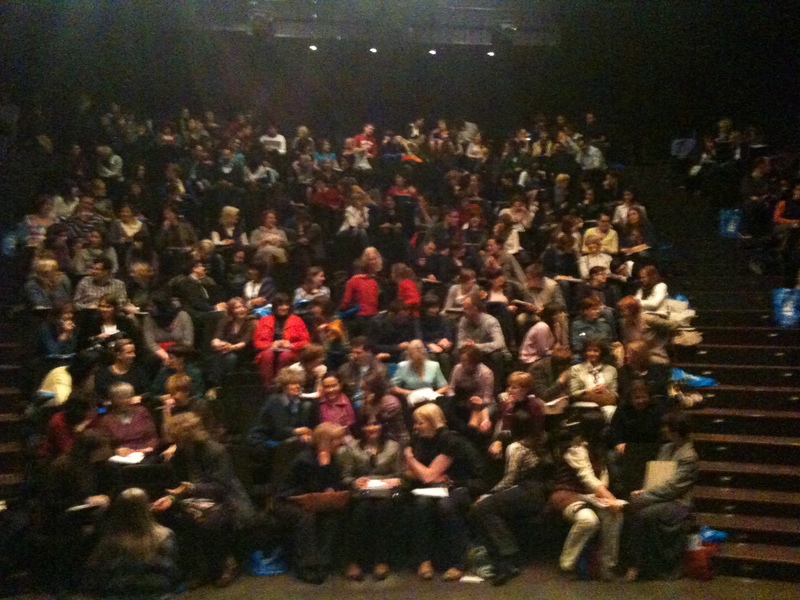 An audience of teachers – the presenter’s view! The question that was preoccupying her – and which always preoccupies me when I start to plan a new session – is how to build a narrative through the presentation. What’s the best way of starting a talk or a workshop? How can images and audio/video be made to contribute to the whole thing? How should you end the session? In short, how do you plan a successful talk? I once went to a workshop on how to be a good presenter given by Mario Rinvolucri. He suggested you should always start by asking the audience to do something (dictate a sentence, for example, which they have to complete and then share with their partners). That takes the pressure off the speaker and makes the audience feel as if they are engaged. Another way is to start by posing a big question – a problem, a dilemma etc – and build a talk on that. You can also start by throwing up an image or recounting an experience which is so arresting (in the sense of attracting attention), that the audience is hooked straight away. You can start by launching straight into a compelling story, and then build a talk on that. But however you start, you have to find a way through all the information that you want to share – or have your participants discuss or interact with. Where’s the path through the woods? Where is (to re-use a word I started with) the narrative? I have to give a talk tomorrow at Canterbury Christchurch University in the south of England. I have decided to use some edited clips of little flipcam interviews (see my earlier post) which I have done with a range of teachers from the UK, Turkey, Pakistan, China, Grenada, Argentina and Romania. In these clips, the teachers describe a successful lesson they have taught. It usually takes them only about a minute or two (you can usually find one of them on the Pearson ELT Community website). I want to get the participants to reflect on teacher beliefs and teacher practice. At least that’s what I THINK I want to do. I could, of course, just show the lots of videos and then just say ‘discuss’. But that doesn’t seem right. I need a story. I need categories, threads (to use Tessa Woodward’s term from her book on planning), hooks for the participants to be able to hang things on. I think it was Raymond Chandler who gave advice to writers who got stuck when writing. Just have someone walk into the room with a gun was his advice, and then the story will kind of take over. – How do you start your talks? – How do you end them? – How do YOU go about planning them? – What’s YOUR personal take on this? Because, even after all this time, it doesn’t get any easier!